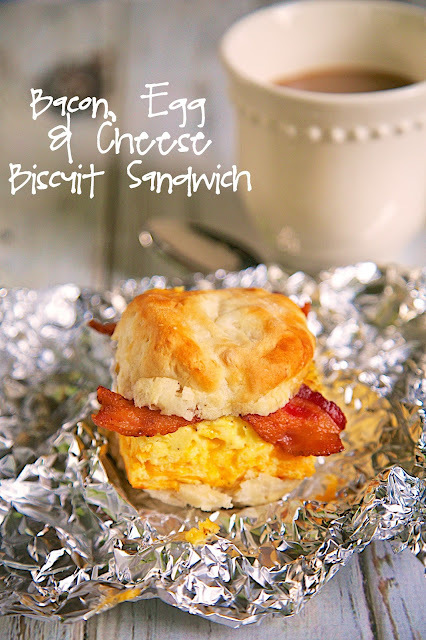 Bacon, Egg & Cheese Biscuit Sandwich Recipe - biscuit topped with a cheesy baked egg casserole and bacon - SO good! 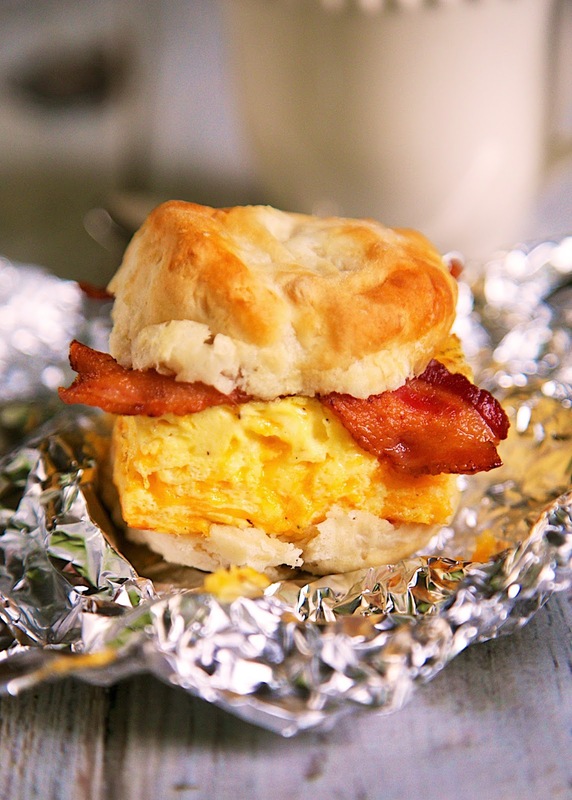 Can assemble the biscuits ahead of time and reheat the next morning for a quick on-the-go breakfast. SO much better than the drive-thru! The Bacon, Egg and Cheese Breakfast Sandwiches are THE BEST! You must make them ASAP! The egg and cheese in the breakfast sandwich isn't just a plain ol' egg topped with cheese. It is a wonderful cheesy egg casserole. The egg casserole would be good on its own, but it is amazing topped on a biscuit with crispy bacon! You can make the egg casserole and assemble the biscuits the night before. Wrap each sandwich in foil, refrigerate and reheat the next morning for a quick on-the-go breakfast. This Bacon, Egg and Cheese Breakfast Sandwich is 1000 times better than the drive-thru you might stop at at on your way to work. I promise! For the casserole: Preheat oven to 350 degrees. Pour melted butter into an 8x8-inch baking dish. Cover bottom of pan with shredded cheese. Whisk together eggs, heavy cream, salt, dry mustard, black pepper and red pepper flakes. Pour egg mixture over cheese. Bake for 25-30 minutes, until top of casserole puffs up and is golden brown. Cool 15 minutes. Cut casserole into 9 squares. Fill each biscuit with a slice of egg casserole and top with bacon. I love the idea of the egg casserole instead of scrambled eggs. I will be making these for quick breakfast on the go. Did you reheat these in the oven? I noticed the foil and thought you did. I did reheat them in the oven. They were great! Enjoy! Oh my, be still my heart (and mouth) - I love this idea. Who makes the biscuits or are they homemade? I used frozen Pillsbury biscuits - I baked them ahead of time.